کانسار مس پورفیری رضی آباد در 30 کیلومتری شمال جیرفت و بخش جنوبی کمربند مس کرمان، در جنوب‌خاوری کمان ماگمایی ارومیه- دختر واقع است. قدیمی ترین واحد آذرین شناخته شده در سامانه پورفیری رضی آباد توالی های آندزیتی- توفی به سن ائوسن است. چندین توده نفوذی شامل دیوریت، گابرو، گرانودیوریت و کوارتزدیوریت به‌همراه دایک هایی با ترکیب مشابه با این توده ها و دایک هایی با ترکیب متفاوت از توده های نفوذی در رضی آباد نفوذ کرده است. کانه زایی مس پورفیری وابسته به یک توده گرانودیوریتی است. ادامه فعالیت ماگمایی پس از تشکیل کانسنگ، منجر به جایگزینی توده کوارتزدیوریتی و دسته هایی از دایک های میکروگرانیتی و آندزیتی- بازالتی در منطقه و قطع شدن کانسنگ توسط این واحدها شده است. 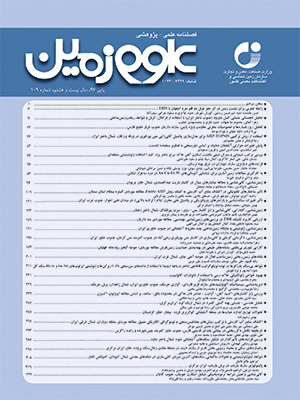 در سامانه پورفیری رضی آباد، مجموعه های دگرسانی کلسیک (اکتینولیتی)، پتاسیک و سیلیسی غنی از مگنتیت و پروپیلیتی گسترش یافته اند. دگرسانی فیلیک با گسترش محدود و شدتی ضعیف به‌صورت برهم نشینی روی دگرسانی پتاسیک تشکیل شده است. در بخش هایی از دگرسانی پتاسیک که تراکم بالای استوک‌ورک های کوارتز و مگنتیت دار دیده می شوند، جانشینی گسترده سیلیس و مگنتیت در متن سنگ دگرسان شده رخ داده است. در کانسار رضی آباد، کانه زایی درونزاد به شکل های افشان، استوک ورک و رگچه ای رخ داده است و به طور چیره از کالکوپیریت+ مگنتیت+ پیریت، به‌همراه مقادیر فرعی مولیبدنیت و اندکی پیروتیت، اسفالریت و گالن تشکیل شده است. بخش عمده کانه‌زایی درونزاد با دگرسانی پتاسیک همراه است. مناطق کانه زایی اکسیدی و غنی شده برونزاد، با گسترش محدود، در بخش های سطحی کانسار تشکیل شده است و نظم چندانی ندارد. بر اساس مطالعه مجموعه های کانی شناسی گرمابی و روابط رگچه ها، فعالیت گرمابی در کانسار رضی آباد به چهار مرحله تقسیم شده است. این مراحل عبارتند از: 1- مرحله سیلیکات کلسیمی- مگنتیت- کوارتز؛ 2- مرحله سیلیکات پتاسیم- سولفید- کوارتز- مگنتیت؛ 3- مرحله سریسیت- کوارتز- پیریت؛ 4- مرحله کلریت- اپیدوت- کلسیت- پیریت± اکتینولیت. 4Research Associate, Division of Geological and Planetary Sciences, California Institute of Technology, Pasadena, U.S.A. The Raziabad porphyry copper deposit is located 30 km north of the city of Jiroft, in southeastern part of the Urumieh-Dokhtar magmatic arc, southeastern Iran. Several intrusive bodies including diorite, gabbro, granodiorite and quartz-diorite associated with groups of dikes with similar composition as well as dissimilar composition with the intrusions, intruded into the Raziabad porphyry system. The porphyry copper mineralization is associated with the granodiorite which intruded into dioritic, gabbroic and volcano-pyroclastic rocks. The magmatic activities continued after mineralization and lead to the emplacement of the quartz-diorite as well as intrusion of two groups of micro-granitic and andesi-basaltic dikes cutting the ore body, causing geometric complexity of the ore body. The alteration zones include potassic and magnetite-rich silicification zones, relatively restricted calcic zone, and propylitic zone. Phyllic alteration with restricted expansion and weak intensity overprinted on potassic alteration. The hypogene mineralization has occurred as disseminated, stockwork and veinlet styles closely associated with the potassic alteration zone. The main ore minerals are chalcopyrite+ magnetite+ pyrite with minor molybdenite, pyrrhotite, galena and sphalerite. The oxidation and enriched supergene zones are variable and restricted to the shallow levels. Hydrothermal activity in Raziabad deposit is classified into four stages on the basis of hydrothermal mineral assemblage and veinlet relation. The stages include: 1) calcium silicate-magnetite-quartz stage; 2) potassium silicate-sulfide-quartz-magnetite; 3) sericite-quartz-pyrite stage; 4) chlorite-epidote-calcite-pyrite±actinolite. تقی پور، ن.، آفتابی، ع. و رمضانی، م.، 1388- بررسی هاله های دگرسانی- کانی زایی و الگوی پراکندگی مس، مولیبدن، طلا و نقره در کانسار مس پورفیری میدوک، شهر بابک، کرمان، فصلنامه علوم زمین، 72، ص. 45 تا 54. شفیعی، ب.، 1387- الگوی فلززائی کمربند مس پورفیری کرمان و رهیافت های اکتشافی آن. رساله دکتری، دانشگاه شهید باهنر کرمان، 257 ص.
Aftabi, A. and Atapour, H., 2010- Alteration geochemistry of volcanic rocks around Sarcheshmeh porphyry copper deposit, Rafsanjan, Kerman, Iran: Implications for regional exploration. Resource Geology, 61: 76–90. Alonso-Perez, R., Muntener, O. and Ulmer, P., 2008- Igneous garnet and amphibole fractionation in the roots of island arcs: experimental constraints on andesitic liquids. Contributions to Mineralogy and Petrology, 157: 541–558. Boynton, W. V., 1984- Cosmochemistry of the earth elements: Meteorite studies, in Henderson, R., ed., Rare earth element geochemistry: Developments in Geochemistry 2: Amsterdam, Elsevier, p. 89–92. Calagari, A. A., 2003- Concentration variations of major and minor elements across various alteration zones in porphyry copper deposit at Sungun, east Azarbaidjan, Iran. Journal of Sciences, Islamic Republic of Iran 14: 27–36. Chiu, H. Y., Chung, S. L., Zarrinkoub, M. H., Mohammadi, S. S., Khatib, M. M. and Iizuka, Y., 2013- Zircon U–Pb age constraints from Iran on the magmatic evolution related to Neotethyan subduction and Zagros orogeny. Lithos, 162-163: 70–87. Defant, M., Xu, J., Kepezhinskas, P., Wang, Q., Zhang, Q., Xiao, L. and Defant, M., 2002- Adakites: some variations on a theme. Acta Petrologica Sinica, 18: 129–142. Dimitrijevic, M. D., 1973- Geology of Kerman region. Geol. Surv. Iran. Report no. Yu/52: 334. Einali, M., Alirezaei, S. and Federica, A., 2014- Chemistry of magmatic and alteration minerals in the Chahfiruzeh porphyry copper deposit, south Iran: implications for the evolution of the magmas and physicochemical conditions of the ore fluids. Turkish Journal of Earth Sciences 23: 147–165. Geiger, S., Haggerty, R., Dilles, J. H ., Reed, M. H. and Matthal, S. K., 2002- New insights from reactive transport modelling: the formation of the sericitic vein envelopes during early hydrothermal alteration at Butte, Montana, Geofluids 2: 185–20. Gustafson, L. B. and Hunt, J. P., 1975- The porphyry copper deposit at El Salvador, Chile. Economic Geology, 70: 857–912. Hassanzadeh, J., 1993- Metallogenic and tectonomagmatic events in the SE sector of the Cenozoic active continental margin of central Iran (Shahr e Babak area, Kerman Province), Ph.D. thesis, University of California, Los Angeles: 204 p.
Kimura, J.I., Yoshida, T. and Iizumi, S., 2002- Origin of low-K Intermediate Lavas at Nekoma Volcano, NE Honshu Arc, Japan: Geochemical Constraints for Lower-Crustal Melts, Journal of Petrology 43: 631–661. Le Maitre, R. W., Bateman, P., Dudek, A., Keller, J., Lameyre Le Bas, M. J., Sabine, P. A., Schmid, R., Sorenson, H., Strekeisen, A., Woolley, A. R. and Zanettin, B., 1989- A classification of igneous rocks and glossary of terms: Oxford, Blackwell, 253 p.
Nedimovic, R., 1973- Exploration for ore deposits in Kerman region. Geol. Surv. Iran. Report no. Yu/53: 247. Parry, W. T., Jasumback, M. and Wilson, P. N., 2002- Clay mineralogy of phyllic and intermediate argillic alteration at Bingham, Utah. Economic Geology 97: 221–239. Pearce, J., 1983- Role of the sub-continental lithosphere in magma genesis at active continental margins, in Hawkesworth, C. J. and Norry, M. J., eds. Continental basalts and mantle xenoliths, Shiva Publications, pp. 230–249. Pearce, J., Harris, N. B. W. and Tindle, A. G., 1984- Trace element discrimination diagrams for the tectonic interpretation of granitic rocks. Journal of Petrology 25: 956–983. Petford, N. and Atherton, M., 1996- Na-rich partial melts from newly underplated basaltic crust: The Cordillera Blanca Batholith, Peru. Journal of Petrology 37: 1491–1521. Saric, V., 1972- Report on exploration at Razi Abad – Madin copper mineral occurrence, Report no. 50/Yu. Shafiei, B., Haschke, M. and Shahabpour, J., 2009- Recycling of orogenic arc crust triggers porphyry Cu mineralization in Kerman Cenozoic arc rocks, southeastern Iran. Mineralium Deposita 44: 265–283. Skewes, M. A., Arévalo, A., Floody, R., Zuñiga, P., Stern, C. R., Goldfarb, R. J. and Nielson, R. L., 2002- The giant El Teniente breccia deposit: Hypogene copper distribution and emplacement, Global Exploration 2002: Integrated Methods of Discovery. Society of Economic Geologists Special Publications 9: 299–332. Whitney, D. L. and Evans, B. W., 2010- Abbreviations for names of rock-forming minerals. American Mineralogist 95: 185–187.